TL;DR: In this series, you will learn how to create modern web applications with Python, Flask, and Angular. You will use this stack to build a SPA and a backend API to expose exams and questions so users can test their knowledge regarding different technologies. In this GitHub repository, you can find the final code created throughout the first part of the series. Part 1 (this one) includes topics like bootstrapping the Flask application, managing Entities with SQLAlchemy ORM, and bootstrapping the Angular application. As you are looking forward to building a modern web application, you will use Auth0 as the identity management system of your app. You will also persist all exams, questions, alternatives, and results on a database. As StackOverflow recently analyzed, Python is one of the fastest-growing programming languages, having surpassed even Java on the number of questions asked on the platform. Besides that, the language is also showing mass adoption on GitHub. On this platform, Python occupied the second position on the number of pull requests opened in 2017. When it comes to developing web applications with Python, you will have to choose between two popular frameworks: Django or Flask. Django is more mature and a little bit more popular than Flask. However, Flask has its strengths too. From the beginning, Flask was built to be scalable and simple to get started with. Applications built with Flask are clearly lighter when compared to Django counterparts. As such, Python developers usually refer to Flask as a microframework. As you can see, by choosing Python, Flask, and Angular to build web applications, you can rest assured that you will always be able to rely on great and thriving communities to support you. "Python, Flask, and Angular form a great stack to build modern web applications." Now that you learned why Python, Flask, and Angular form a great stack to build modern web applications, you are ready to install the local dependencies. This section is divided into two subsections to highlight what are the environment dependencies from the backend and from the frontend perspectives. To start with, you will need an up to date version of Python 3. If you don't have Python 3 available on your development machine, please, browse to the Python download page and install it. After installing Python, you will have to install the pipenv tool. This tool aims at bringing the best of all packaging worlds (bundler, composer, npm, etc.) to Python developers. Also, this tool is a first–class citizen on Windows. So, if you are still stuck on this operating system, don't worry, you are covered. Python and pipenv together are enough to start developing your Flask application. However, as you want to persist transactional data, you still need to choose and configure a database engine. To make your life easier, you will use SQLAlchemy to persist and retrieve data from the chosen engine. If you don't have experience with SQLAlchemy, please, check this nice introductory article on the subject. There, you will learn that by using the SQLAlchemy ORM (Object Relational Mapping) extension, you will be able to easily connect and use any major SQL database engine (e.g. MySQL, PostgreSQL, SQL Server, etc). Of course, to run the command above, you will need to have Docker installed locally. As you are going to use Angular to create your frontend application, you will need Node.js and NPM installed on your machine. You can install both tools simultaneously by downloading and executing an installer (choose one based on your operating system) from the Node.js download page. Another alternative is to use a tool like NVM to manage multiple active node versions. On a development machine, this is probably the best option. Whichever installation method you choose, make sure you are using an up to date version of Node.js (i.e. >= 8). After properly installing Node.js and NPM, you can use the npm command to install the Angular CLI tool. You will use this CLI (Command Line Interface) to bootstrap the frontend app, start a development server, and to create Angular components, services, etc. Then, you will want to use pipenv to create a virtual environment. If you don't know why you need a virtual environment, check out this great article written by the author of pipenv. As you are using Git to backup your code, you will probably want to ignore some files. To do this, create a file called .gitignore in the project root directory and copy the rules from this URL into it. With your virtual environment set up, you can start developing the features of your application. A good place to start is to define entities and to configure SQLAlchemy to persist and retrieve instances of these entities. 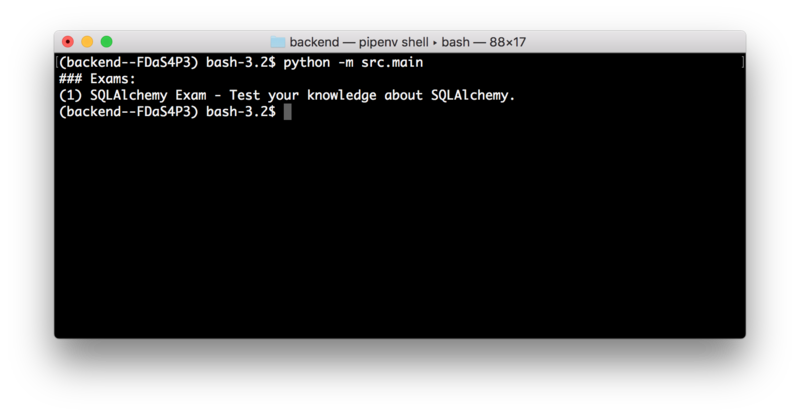 As such, you will use pipenv to install the sqlalchemy package and a driver to connect to your database. If you are using PostgreSQL, you can use the psycopg2-binary driver alongside with SQLAlchemy. If you are using another database engine, please, check this page to choose a good driver. Here, you are defining a class called Exam that inherits from Entity and from Base. This entity contains, besides the properties defined by its superclasses, two properties: title and description. Besides that, this class also defines that instances of it must be persisted to and retrieved from a table called exams. It starts by importing Session, engine, and Base from the .entities.entity module. Then, it imports the Exam class from the .entities.exam module. Then, it generates (if needed) the database schema. After generating the schema, it queries all instances of Exam. Then, if there are no exams on the database, it creates a new one and queries all instances of the Exam class again. Lastly, it prints the exams retrieved from the database. If everything works as expected, your module will create an instance of Exam, persist to the database, and print its details on the terminal. git add . && git commit -m "adding SQLAlchemy and some entities"
In the new version of this file, you are using the Schema class of marshmallow to define a new class called ExamSchema. You will use this class to transform instances of Exam into JSON objects. 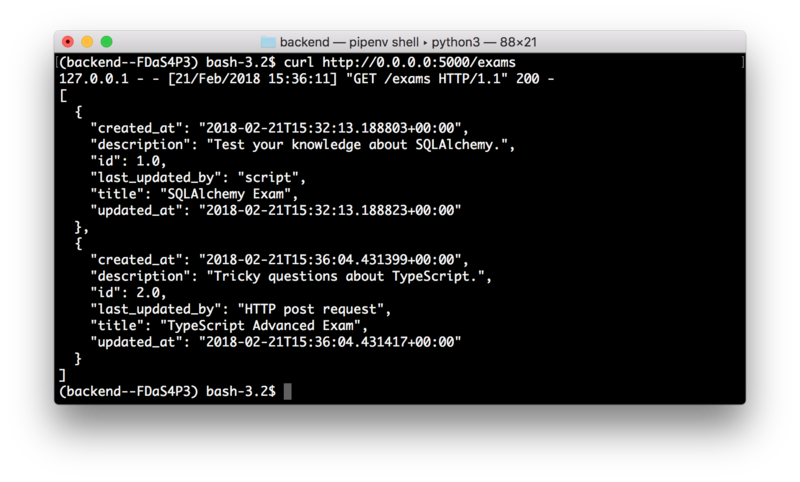 This file now creates a Flask application, based on SQLAlchemy and PostgreSQL, that is capable of accepting POST requests to create new instances of exam and capable of accepting GET requests to serialize these instances as a JSON array. and it runs flask listening on all interfaces (-h 0.0.0.0). The first command on the snippet above transforms the bootstrap.sh script into an executable file. After that, it runs this script in the backend so you can keep using the same terminal. When the Flask application is up and running, you can use the two curl commands to interact with it. The first one issues POST requests to create new exams and the second one lists all exams persisted on the database. Besides using curl, you can also fetch exams by browsing to http://0.0.0.0:5000/exams. git add . && git commit -m "integrating Flask RESTful endpoints and SQLAlchemy"
As your Flask app will receive requests from a SPA, you will need to allow CORS on it. If you don't do so, most browsers will block requests to your API because the backend does not explicitly allow Cross-Origin Resource Sharing (CORS). Without any further configuration, flask-cors allows CORS for all domains on all routes. During the development process, this configuration will be enough. However, in the future, you will probably want to be more restrictive. When the day comes, check the official documentation of the flask-cors module to learn how to tweak these settings. git add . && git commit -m "enabling CORS"
git add . && git commit -m "bootstrapping an Angular project"
For now, this TypeScript module simply exports a single constant (API_URL) that references your Flask backend application running locally. In the third part of this series, you will enhance this module to define different API_URL values depending on the environment. git commit -m "integrating Flask and Angular"
"Developing web applications with Angular and Flask is easy!" In the first part of this series, you used pipenv to bootstrap a Flask backend API. After that, you used SQLAlchemy ORM to integrate your Flask app with a database. Then, you installed and ran Angular CLI to create a new Angular SPA . In the end, you made your SPA fetch exams from the backend to show to visitors. These features together pave the way to create an application that relies on Flask and Angular to deliver a modern user experience. In the next article, you will learn how modern web apps manage identity and you will enhance both your backend and your frontend apps to include more features. Stay tuned!